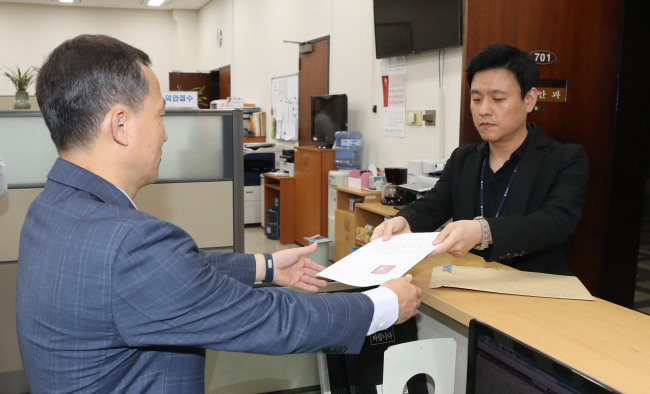 South Korea's government on Tuesday submitted a motion for the parliamentary ratification of the April inter-Korean summit declaration to secure bipartisan support for its enforcement ahead of another summit slated for next week. The unification ministry sent to the National Assembly the motion for the Panmunjom Declaration aimed at enhancing cross-border cooperation and exchanges and pursuing the "complete denuclearization" of the peninsula. It also attached to the motion the estimate for the cost of implementing part of the summit agreement next year, which amounts to 298.6 billion won ($264.8 million). The cost includes the estimated outlays for inter-Korean cooperation over railways, roads and forestry. The presidential office Cheong Wa Dae has hoped to gain parliamentary approval for the motion before the third summit between President Moon Jae-in and North Korean leader Kim Jong-un from Sept. 18-20. But the parliamentary leaders decided to discuss the ratification issue after the upcoming summit.